As you can see, in the group below, one person has a blue chat bubble and the others are grey. The one with the blue is the only one who does not receive the messages to his phone. Please do not ask me a bunch of questions about versions of apps or who our carrier is. i have just one simple question: what do the different colors signify exactly? Also, please do not guess at it. Somebody created this app and told it to display the different colors and that person should have told other employees what they mean. It should be written down somewhere. Hopefully Verizon has competent employees who are capable of answering this one simple question. It's important to understand how our handy Verizon Messages+ features work. I'm happy to clarify your concern about the conversation bubbles. The conversation bubbles don't signify anything by default. Rather, they are meant to be customized by you as a way to organize your contacts. For example, you might want to color code your work contacts all with the same color. To change the color of the bubbles: tap the three dots in the top right corner of the Verizon Messages+ app, select "customize" and then "conversation bubble". Does this clarify? Also, are you still having issues with sending messages to that one contact? If so, do they have an iPhone? I'm going to assume that you cannot see the screenshot i posted in my question. Thank you for the answer, however, i wasn't referring to the conversation bubbles. After creating a group, and adding people to that group, when i vote the list of people in the group, each person has two icons to the far right of the screen. If i tap one icon (the phone), i can call that individual. If i tap the other icon, (the chat bubble), i can send that individual a private text message. It is this chat bubble to which i am referring. 3 people in that list have a gray chat bubble. 1 has a blue chat bubble. That one person does not receive the messages from any of the rest of us in the group. He does receive individual texts. He has an Android, i have an Android, and i know one guy has an iphone (i don't know about the other two). I appreciate the additional detail, jgennusa. We certainly want to resolve this for you. The blue bubble signifies that the other user has Messages + and is using the chat feature. 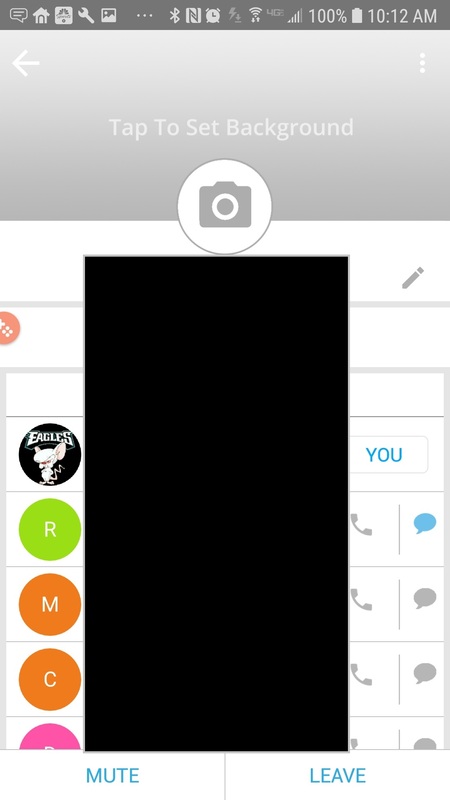 Do you know if that user is able to send a receive regular MMS messages? Are they able to send and receive messages in other groups? Did you ever find a solution to this? I am having the same issue with two of my contacts. the same problem in messenger, when the person in my participant list of a group has a blue bubble to the far right of their name on the group list, they do not getthe message + group messages. can this be fixed. Keeping you connected with text messaging is our goal jgutow, text messaging is how we all communicate. Don't worry we will make sure that yours are working as they should be. Did this start recently, how long has this been going on? What is the make and model of your phone? I am having this same problem. I have a group in which one of the participants never receives our group messages (she is 1 of 2 with the blue chat bubble - interestingly the other one gets the messages). I've tried removing her and then adding her back, and I've even deleted the group and restarted it from scratch. She still doesn't get the group messages, which is a real pain because it's an active group and I have to copy and paste everything to her, which I simply do not have time for. I read that the blue chat bubble only means they also have message+, so I can't imagine why this person wouldn't be able to get the group messages. Help please! You performed diligent troubleshooting steps for everything on your end to try and resolve that with the contacts, and message threads. Since everyone else in the group receives the messages fine, and the one user doesn’t receive them it would then have to be an issue with the messaging app/device settings or network connection on the other party’s end.